Hello, here is what happened in NYC at the TRU workshop! NUMBERS NERDS was selected to perform part of the show last weekend at a workshop in New York! Theatre Resources Unlimited selected six musicals to be featured in front of a panel of Broadway professionals. And, we were THERE! 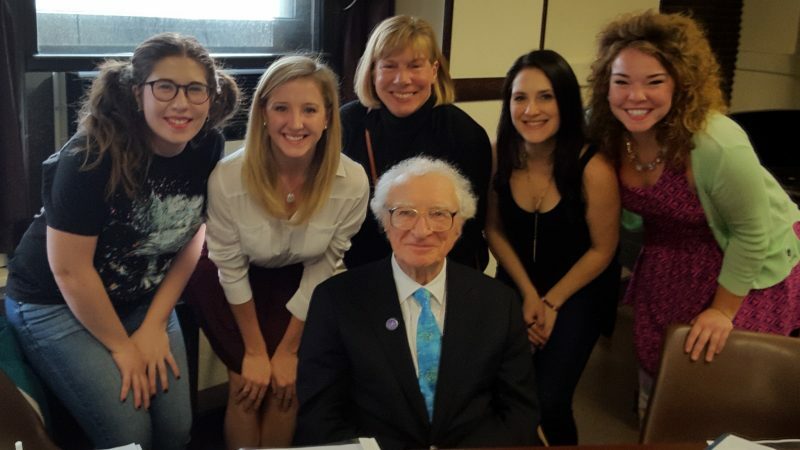 Along with two Chicago actresses that you saw performing the same roles – Maisie Rose and Madison Kauffman, were three New York professional performers who made the wonderful characters come alive! One of the panelists was Sheldon Harnick. Mr. Harnick wrote the lyrics to FIDDLER ON THE ROOF and SHE LOVES ME. After he saw our performance, he gave the only performer compliment of the day to our magnificent Maisie Rose! We received great feedback about the first part of the show, now we have to work on making those changes! One more thing…..NUMBERS NERDS was also selected to be featured in the ITA Community Theatre Festival in November! We are thrilled to be a part of this festival where we will perform for dozens of community theatre directors and producers. Lastly, I wanted you to know that I have added you to my regular blog list. You can unsubscribe anytime by letting me know. You will get more updates about NUMBERS NERDS as well as read about some fun musical theatre stuff. Thank you so much for your support as we work to bring NUMBERS NERDS to schools and community theatres around the country!